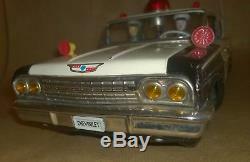 Vintage Ichiko Chevrolet 4-doors hardtop police car 37 cm. With flashing roof dome light, two sirens, antenna and two vinyl police occupants. 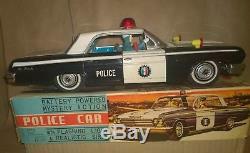 Battery powered with mistery action and a realistic siren, in very nice and working condition. 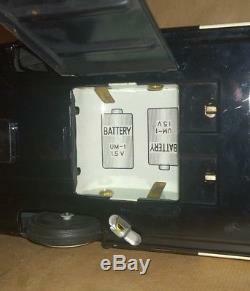 The battery compartment is clean L 37 cm. 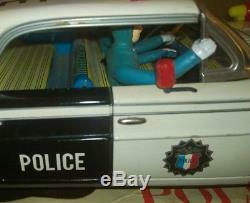 The item "Vintage Ichiko Chevrolet 4-doors hardtop police car 37 cm. In Box" is in sale since Monday, April 09, 2018. This item is in the category "Toys & Hobbies\Vintage & Antique Toys\Tin\Vehicles". The seller is "vollertoys" and is located in 's-Gravenhage.